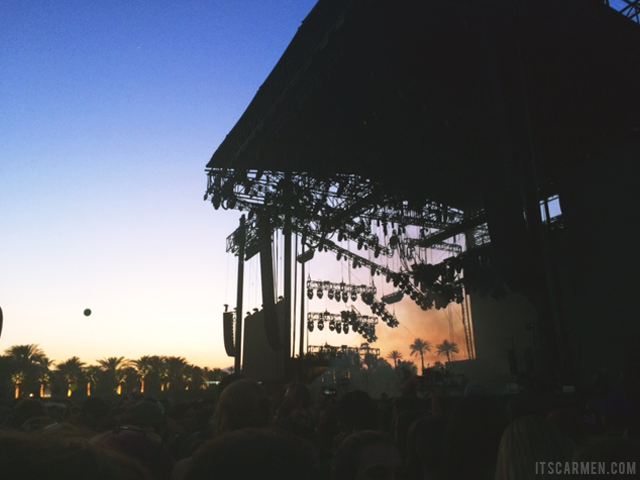 Weekend 2 of the Coachella Music & Arts Festival is already in full effect! But don't worry. I went last week, so I have all the details & inside scoop on what went down, the fashion trends everyone was wearing, the scrumptious food, & of course the music. 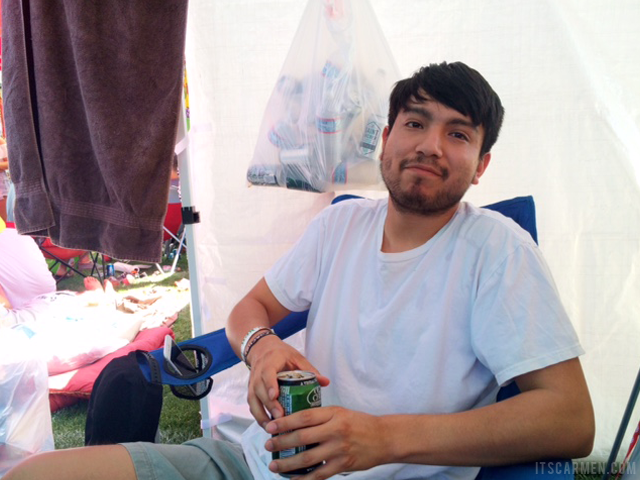 If you didn't read it, check out my Coachella Recap for Day 1. We spent the morning making breakfast & drinking a couple beers prior to heading out. Beers & alcoholic beverages run about $11 inside the venue, so unless you want to go broke after a drink or two it's best to have your own at the campsite. On Day 2 we went into the venue a little later than Day 1 because we were so exhausted from the day before. 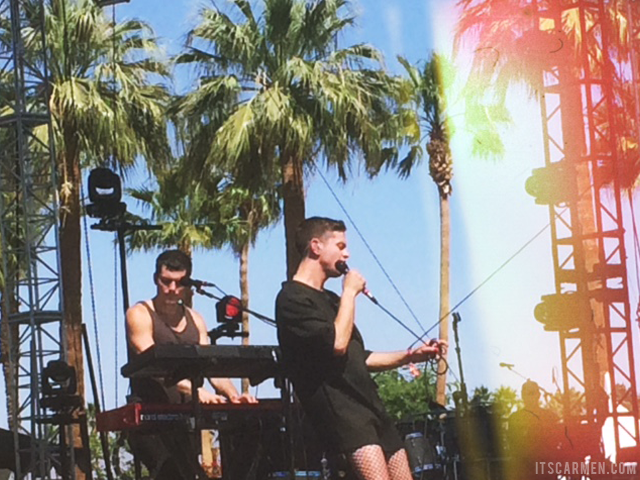 We went to Perfume Genius at 1:55 - 2:35 pm at the Outdoor Theatre. He was sporting an over sized black t-shirt, black mini shorts, fishnet stockings, & booties. His voice was smooth & buttery like a blanket warming you up on a cold day. His set was a pleasant surprise; my boyfriend & I both loved him. Definitely a top act from the weekend. The next set we saw was Bad Suns from 3:20 - 4 pm in the Mohave Tent. They played their classic hit song Cardiac Arrest. I'm a little ashamed to say this but we were so busted from the day before spending all day in the sun, dancing, & walking around that we went back to our campsite after Bad Sun's performance to take a nap. Although it was a time waster & we didn't see any artists, it was absolutely vital for us to be able to survive the rest of the day/weekend. We went back inside after our nap under the canopy & picked up some lunch: vegetarian gyros & fries. The gyro was a great disappointment since it was literally naan bread, lettuce, onion, & some sort of tzatziki sauce. Not worth the $11. 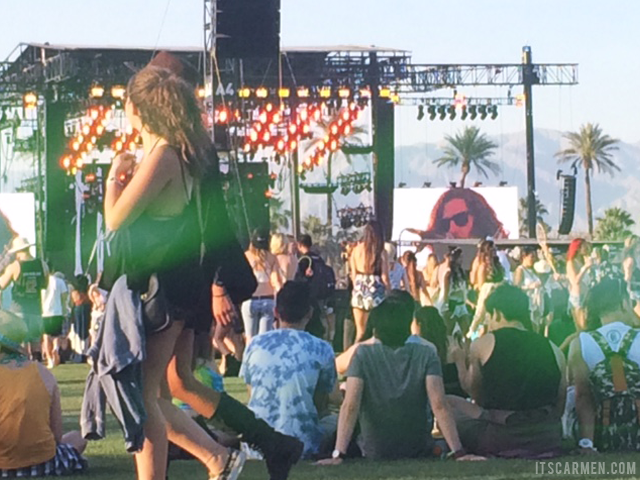 We trekked to the Coachella Stage for Hozier's performance at 6 - 6:55. His audience was pretty packed. We sat down in the back munching on our food, bobbing our heads to the music. At 6:55 - 7:45 we went to see Run the Jewels back at the Mojave but left a little early to go back to the Coachella Stage to watch Alt-J at 7:30 - 8:30. See what I mean about a lot of walking? Their set was exciting, colorful, & the crowd was clearly thrilled to be there, singing & dancing along. I particularly enjoyed watching the woman doing sign language on stage. She was signing & dancing; it was a performance by itself! At 9:15 - 10:05 at the Outdoor Theatre we caught Tyler the Creator who was surprisingly pleasant & cordial. Although he did call out the VIP section for being boring & not dancing. Guess who was in the VIP section. Kendell Jenner. Tyler jokingly personally called her out on stage as well. 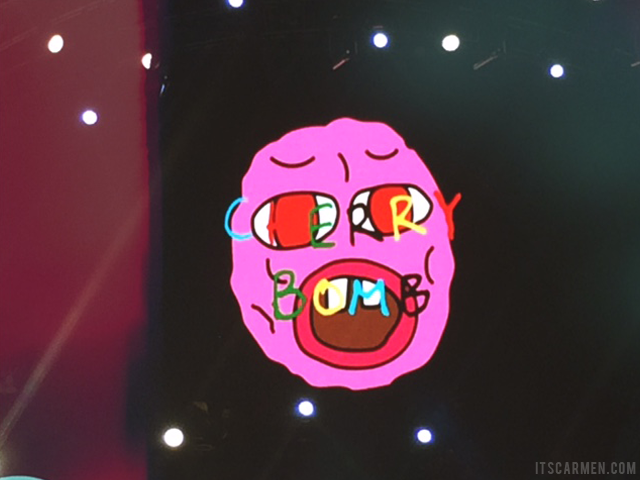 Due to all the water drinking to stay hydrated (& some alcohol drinking) in the desert heat, I had to leave Tyler the Creator's set early to use the extremely gross bathrooms. 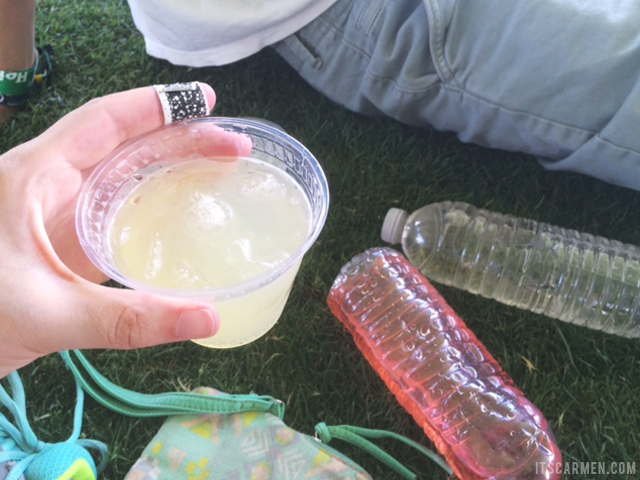 We sat down in the back, recouping for the rest of the set then head over to see Jack White at the Coachella Stage. His crowd was enormous so once again we sat down letting the music sink in. Boy could Jack White shred on that guitar & he sounded magnificent live. His voice is golden. We hung around a little bit more after Jack White's set for The Weeknd who was supposed to start at 11:25. He ended up beginning about 15 minutes late. There was no intro. There was no beginning. He just started singing. And damn, he was marvelous as well. His solo performance was everything I imagined it would be, just wish I could've seen it better. What a super job defining your Coachella experience! 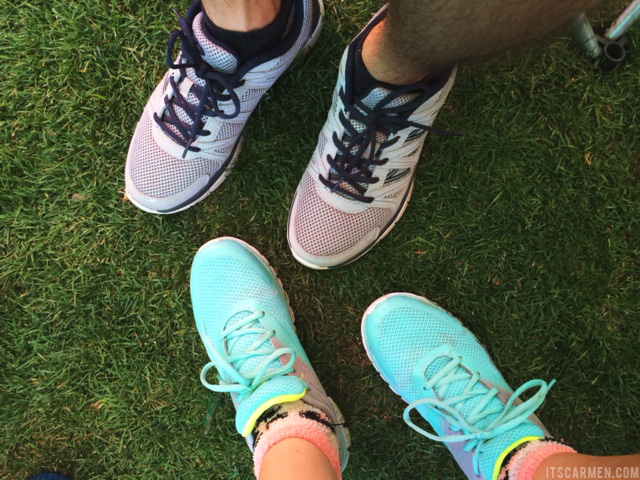 So adorable that you got matching Target trainers for all the walking! I went last year and saw the Pixies who were amazing!! There was a sand storm and it was crazy hot! Sounds like you had fine…I would have liked to have seen Alt-J. Me too! Would me an amazing experience! You were lucky, Carmen! ;-) Sorry about the food... Great impressions anyway,dear! Looks so great! I can't wait to go to Coachella. Great post :) It looks like an amazing day! Nice!! I love seeing your coachella photos, looks like you had a good time! Jack White is so talented! I saw him several years ago in concert. Looks like you are having a great time, wish I could attend someday! 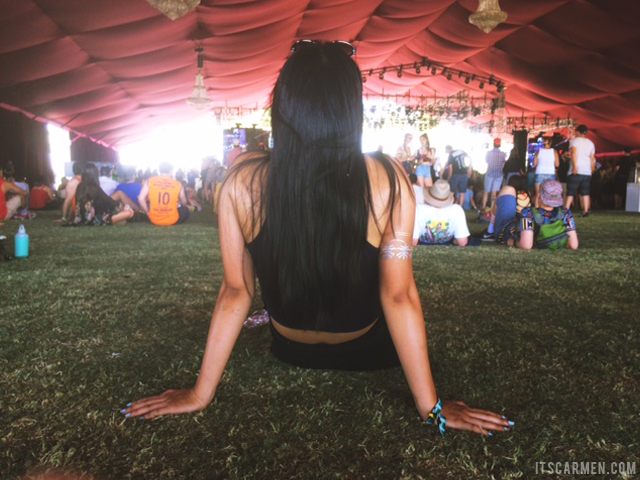 I really enjoyed reading this post Carmen, it was so interesting and refreshing to read about your experience at the Coachella music festival as most of the Internet sites usually only cover the fashion part of it! Great post! 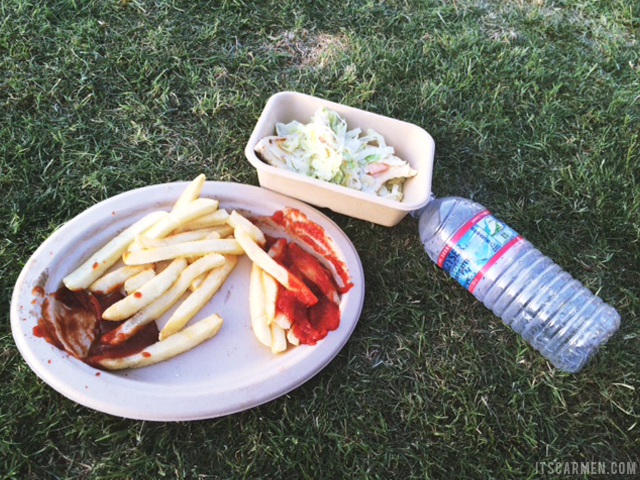 I always assumed Coachella food was actually decent, expensive but decent. And I would have loved to see Drake and Hozier, I think Drake was performing day 3? Great post btw Carmen, enjoyed reading it! looks like you guys had a great time at Coachella. I am always amazed by the fashion trend at the music festival. Great post! Oooh this looks like a spectacular event! Fun photos. Looks like so much funnn!!! I'm so jealous that you went to Coachella! It looks like so much fun!! So jealous! What a great recap! I always wish I would go, but your recap is great! I'm not sure I could handle 3 days. Looks amazing, its a dream of mine to go! I want to see Hozier live so bad! 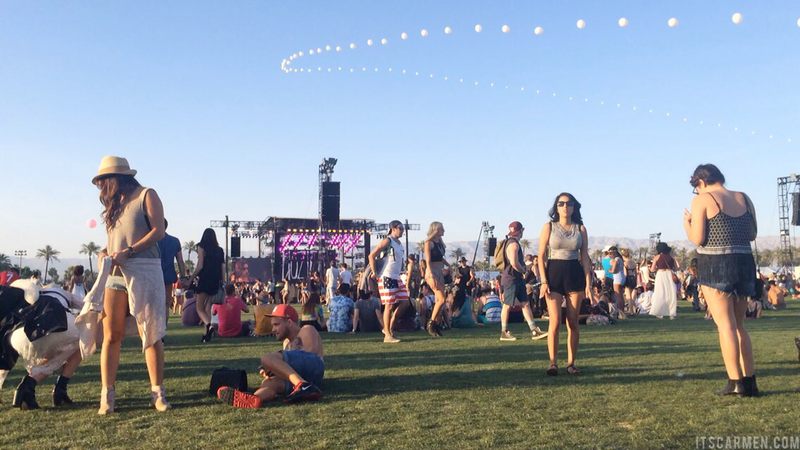 Looks like such fun, Coachella!